Miami’s on board with the Linsanity. As Jeremy Lin leads the New York Knicks into American Airlines Arena tonight, South Beach residents have paid an average $249.71 to see the Big Three weather the Lin-derstorm (sorry, that doesn’t work very well). That’s double the price of the average home game ticket sold for Miami Heat home games ($124.60 average) on the secondary market. 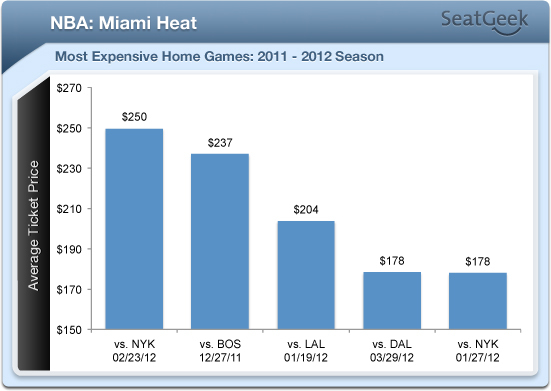 In fact, tonight’s game is the Heat’s most expensive home game for the abbreviated 2011-2012 season. As Expensive as the NBA Finals? Tonight’s game is the tenth most expensive Miami Heat home game since 2009 (when SeatGeek started tracking data). This game is in rarified company as it’s the third most expensive regular season game, behind the March 10th, 2011 game vs. the Los Angeles Lakers ($322.89) and the October 29th, 2010 game vs. the Orlando Magic ($298.84). The most expensive game tracked by SeatGeek is last years NBA Finals Game Six against the Dallas Mavericks ($565.76), where the Mavs walked away with their first NBA title. Perhaps this is an NBA Eastern Conference Finals preview, and the demand shows it on the secondary ticket market. The average ticket price for tonight’s game before Jeremy Lin’s breakout game against the New Jersey Nets was $194.90. Since February 4th, prices are averaging $281.30 or 44.33% more expensive. However, South Beach didn’t jump on board right away, perhaps dismissing Jeremy Lin’s breakout play as a flash in the pan. Coupled with Carmelo Anthony’s injury on February 8th and Amar’e Stoudamire attending family matters in regards to his brother’s death, tickets sold well below average, selling at $166.43, a drop of 37.26% from average price. In spite of questionable returns from the Knicks big stars, Miami hit JLin fever pitch with average prices shooting up to $222.86 the week of February 12th – 18th. Tickets have shot up tremendously since the New York Knicks win against the Dallas Mavericks. The average ticket price for this week is $385.40, an price increase of 72.90% in the past week. Not only has average ticket price increase, but also volume has multiplied as well. 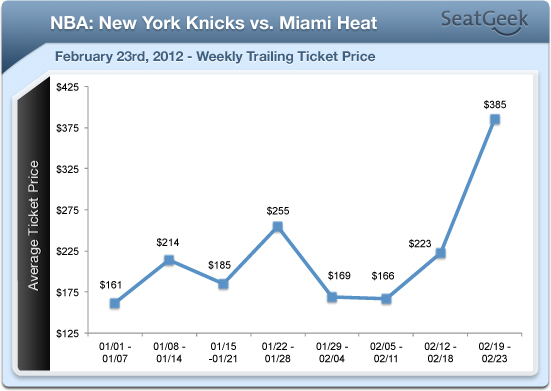 During the past two weeks of Linsanity, ticket sales increased nearly threefold (276.06% increase in volume).